I am currently the Open Access (OA) Librarian in the Office of Scholarly Communications at UNC Libraries. This is a newly created position in a small department, so I work on many different aspects within Schol Comm. One of my primary roles is to lead the outreach and communication initiatives for the UNC Faculty Council’s Open Access Policy implementation, which so far has included collaborating with a marketing firm on a campaign for OA awareness and authors’ rights, developing faculty and graduate student competencies in OA, and establishing connections with UNC departments to deposit materials in the Carolina Digital Repository. I also frequently get to work with (TRLN) Scholarly Communications colleagues to support cross-institutional programs and events. That depends on the day! Over the past month, I have had several opportunities to visit department meetings and have been blown away by the interest from the faculty. 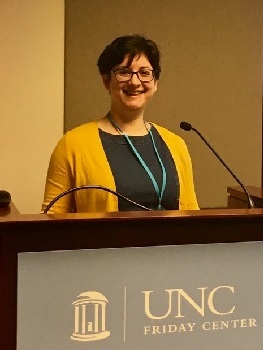 I have also been meeting with several graduate students in the UNC School of Information and Library Science and we’re cooking up some very exciting plans for OA in the fall. 3. If you had a magic wand and could change one thing in the scholcomm ecosystem, what would it be? Imposter syndrome. From librarians, to faculty, to students, to publishers, I have so many conversations with people that stem from their fears about being a fraud. Sometimes this prevents people from asking for help, sharing their accomplishments, or even discussing ideas with potential collaborators. My magic wand would cast a spell for an open and transparent environment in which scholarship and the people who produce it, use it, access it, make it discoverable, and preserve it can do their work without so much anxiety. 4. If you were NOT a scholcomm librarian, what would you be? A career counselor! Throughout my own career I have worked in many different industries and I’m fascinated by emerging careers and changing workplace cultures. I love helping people to think about the type of work they want to do and how their previous experience and interests have prepared them to take on new challenges.